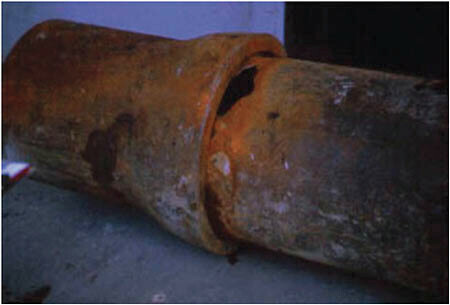 Electrical Discontinuity in Ductile Iron PipeSeveral factors suggest the on-going need to continually study the effect of corrosion on electrical discontinuity in ductile iron pipes (DIP). For instance, according to a 2002 congressional study, corrosion costs U.S. water and wastewater systems over $50.7 billion annually. The American Society of Civil Engineers’ (ASCE) 2013 “Report Card for America’s Infrastructure” graded U.S. potable water and wastewater infrastructure a “D.” American Water Works Association’s “2014 State of the Water Industry” report cited the top two water industry issues as: 1) state of water and sewer infrastructure, and 2) long-term water supply availability. “Corrosion is an electrochemical process involving both a chemical reaction and the flow of electrical current. In order for corrosion to occur, there must be an anode and a cathode, electrically connected by a metallic path, with the anode and cathode immersed in an electrically conductive electrolyte that is ionized. There must also be an electrical potential between the anode and the cathode. If any of these components are eliminated, corrosion cannot occur. The Bevel-Sert is a beveled radius used in conjunction with buried Ductile Iron Pipe and push on fittings. The Bevel-Sert is made out of 3608/4710 NSF-61 Certified High Density Polyethylene (HDPE) material and accommodates the outside diameter of the spigot end of the ductile iron pipe. The integral flange acts as a bendable wrap around the spigot end and becomes a barrier between the spigot and the bell ends. 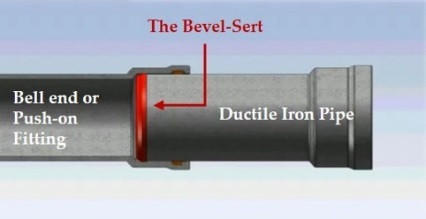 When used in Ductile Iron Pipe applications, the Bevel-Sert acts as an insulator and a barrier to electrical current at each joint, promoting the existence of an electrically discontinuous pipe joint segment when the joint segment is bottomed out in the bell.